This journal offers a venue for researchers, practitioners, and policy makers interested in a life-conducive economic system for which humanistic management is critical. 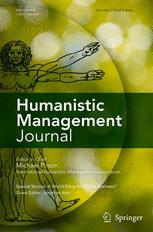 The field of humanistic management has gained increased attention with concepts of social business, social entrepreneurship, conscious capitalism, cooperative capitalism and similar concepts on the rise. The journal brings the disparate fields of business ethics, environmental and social sustainability as well as management studies together under the tent of a humanistically-based research paradigm. The Journal adopts double blind peer review. The Power of Music: Can Music at Work Help to Create more Ethical Organizations?